Hello friends and readers! I apologize for not posting anything for the entire week. Our family caught a nasty flu a few days before Christmas and we got really sick. Since I am the only person taking care of my children apart from my husband who is working full time, I had a hard time with my schedule. But now that most of the kids are getting better, I am very thankful and also excited to share with you more recipes I personally prepare in my kitchen and enjoyed by my family. Today’s post is for a quick recipe of sautéed green beans with bacon and egg whites. Green beans are inexpensive and versatile ingredient that I often use in cooking. I love them steamed, sautéed, baked, battered and fried. 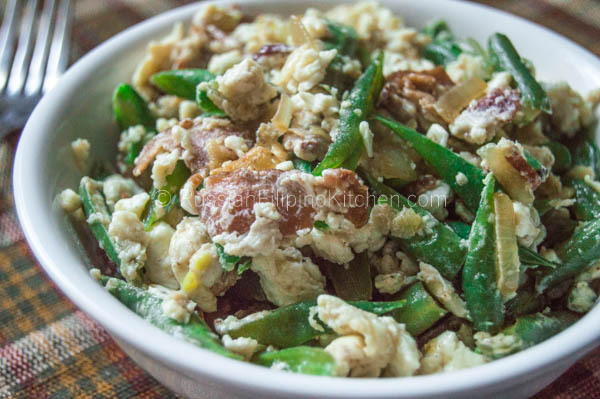 One of my favorite Filipino dish is ginisang green beans with rice. Green beans are one of the important ingredients in making pancit and enhance the flavor of soups such as linat-ang pork ribs. You may be wondering about the recipe including only “egg whites”. Well, I happen to have plenty of egg whites after making leche flan yesterday. This recipe is perfect for putting to good use any leftover egg whites you have. But of course you can use whole eggs if you prefer it that way. It’s a fairly easy dish that’s rich in protein and simply delicious. I enjoy this for breakfast with a slice of toast and hot cup of cocoa. Two weeks ago, I tried a leche flan recipe from a fellow blogger Mema Rose of Rosemarie’s Kitchen. My own steamed leche flan is good but I’ve always been curious to try other flan recipes that are equally delicious, and hers is a keeper. It’s smooth and creamy and really good especially with the meringue topping. Her recipe uses egg yolks just like my recipe. After using all the egg yolks from 20 eggs and only 4 egg whites, I was left with still plenty of egg whites. I refrigerated the leftovers and cooked some of it with green beans and bacon for breakfast the next day. The following is the recipe. 1. Heat up skillet over medium high and add chopped bacon. Cook until browned and most of the fat comes out, about 3-4 minutes. 2. Add onions and garlic until onions become translucent and garlic has browned a little, about 2 minutes. 3. Throw in green beans and sauté for a minute. Add soy sauce, mix and cover. Cook for 3 minutes or so mixing once, until beans has softened. 4. Make a well on center of skillet and add egg whites. Cover for another minute until eggs are cooked halfway. 5. Mix everything together, season with ground black pepper, and cook for additional 2 minutes until the eggs are thoroughly cooked. Heat up skillet over medium high and add chopped bacon. Cook until browned and most of the fat comes out, about 3-4 minutes. Add onions and garlic until onions become translucent and garlic has browned a little, about 2 minutes. Throw in green beans and sauté for a minute. Add soy sauce, mix and cover. Cook for 3 minutes or so mixing once, until beans has softened. Make a well on center of skillet and add egg whites. Cover for another minute until eggs are cooked halfway. Mix everything together, season with ground black pepper, and cook for additional 2 minutes until the eggs are thoroughly cooked. This looks so yummy – great use of the egg whites. I usually end up making egg-white omelettes, this is a nice change. Thanks! Try it next time. It’s really good! Bacon! And I hope everyone is feeling better. Happy holidays to you and your family, Mia! By the way, thanks for the shout out about my mom’s Lecha Flan. So glad you enjoyed it. I’ve linked your Sauteed Green Beans to that recipe as a suggestion for what to do with the egg whites. Hope you don’t mind.